Telecommunications, Electrical, Data, and Video installers should all have a TDR in their toolkit. From measuring the length remaining on a drum to knowing exactly where to dig to find that cable fault the Cable Gauge can be invaluable. Opens, Shorts, and length are all measured by the metre letting you know how much you have or where the issue is. Stocktaking of cables is made simple using the Cable Gauge. 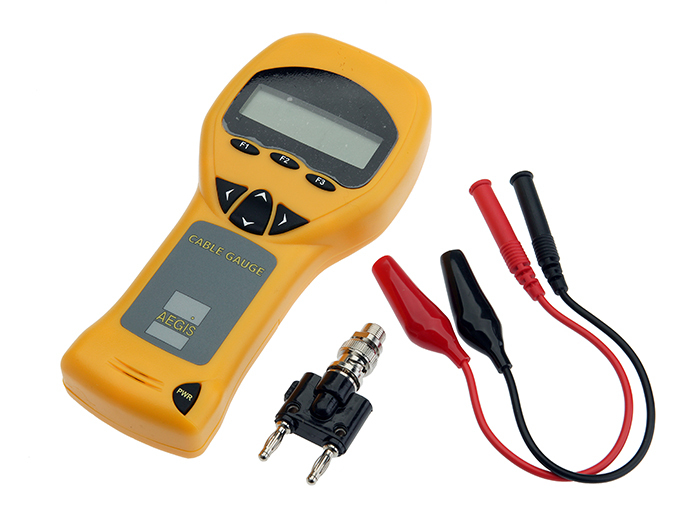 Using TDR technology, the Cable Gauge diagnoses cable faults with no launch or dead zone at an accuracy of ±2%. Simply select the appropriate cable type from the pre-stored library or enter the cable NVP, attach the leads to two conductors of the cable and with a single press of a button the length of the cable or distance to an open or short is displayed. Voltage on the wires up to 250v is continuously measured by the built in, true RMS voltmeter and is displayed to warn of a potentially unsafe condition. The Cable Gauge will also inject a tracing tone onto the conductors to trace cables with a probe. The universal banana jack test lead connectors allow for a wide range of adapters for any connector type. In addition, a BNC and F adapter are included.